While the Teamsters Local 727 Bargaining Committee presented proposals to address safety concerns through improved working conditions, more technician hours and increased overlap, CVS management demanded across-the-board cuts to pharmacists’ benefits with diminished protections as contract negotiations opened on March 24. Teamsters Local 727 is vehemently fighting Coca-Cola Refreshments’ attempts to charge employees higher insurance premiums than those explicitly set forth in the new collective bargaining agreement. Bargaining on March 24 began with Pepsi all but refusing to unify its employees by merging nearly identical language into one unified and understandable contract. 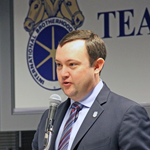 More than 100 Teamsters Local 727 members, officers, representatives and staff came together to discuss the good and welfare of the local union during the general membership meeting March 13.